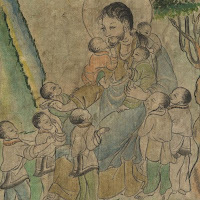 Images of Jesus embracing cherub-faced children have been irresistible throughout the centuries. Sentimental art within the last hundred years or so has given us the “sweet Victorian Nanny Jesus” (Philip Yancey’s memorable description), patting boys and girls on the head, admonishing them, one supposes, to eat all their vegetables and be nice to mummy. It’s hard to set aside such treacly visuals when we hear Mark say, “Then he took a little child and put it among them, and taking it in his arms . . . “ It’s hard not to wax a little sentimental about Jesus, children, the church, and Christianity itself. The observant preacher, however, will recognize that this week’s passage from Mark’s gospel is not really about children. It’s about misidentified power; it’s about an upside-down kingdom; it’s about the scandal of the cross and the way of discipleship. But it is worth reflecting for a moment on how we understand the discipleship of children in the church and what it means to introduce them to the habit and lifelong practice of Christian worship. Children, as we know, have a great capacity for imaginative engagement with the world around them. They readily enter the world created by a good story (and they usually know a good story from a not-so-good one). Children need to hear the Bible’s stories in worship—not because they will understand them better there, but because that is where the stories do their formative work, shaping a people week after week, season after season, year after year. When we use the Bible’s stories to impart pious moralisms to children (“be good,” “be helpful,” be nice to your brother”) we minimize Scripture’s real purpose and power, and we fail to communicate to our children that in worship—in the hearing of the Word, the preaching of it, the performance of it through gestures, postures, and holy sign-acts—they (along with us) enter that world and have the hope of being transformed through time—God’s time—by its vision and power. And since repetition is the key to effective pedagogy, we should regularly communicate to children (and their parents) that they are integral to the whole worshiping body; that their presence is not merely tolerated but happily anticipated. When we “dismiss” children from the worshiping body (for children’s church, say), no matter how well-intentioned our efforts at teaching them about worship may be, we convey to them and to everyone else that dividing the worshiping body is an acceptable norm. But it is also important that worship not cater to children. Worship that seeks above all else to enact God’s story of redemption and to imagine God’s politics of peace invites and expects the participation of the whole household of faith—young and old, rich and poor, the able and the infirm—with the understanding that, in regard to young children especially, there are privileges reserved for their maturity, mysteries and riches of the worshiping life that reveal themselves as rewards for years of practice and perseverance. Finally, we engage in the work of introducing children to worship—and overseeing their ongoing participation in it—not in an effort to make them good but that they might know who they are. And we do this with the hope that worship which is attentive to the gospel’s grand story will do its transforming work in their lives (and ours), will feed their imaginations and not their egos, and will help them (and us) learn to order our lives by the gift of God’s time. I only know the phrase from Yancey's book which, as you note, doesn't mention where it comes from in Dickens. Sorry. Thanks for taking the time to comment, though–I appreciate it. Thanks, Debbie. I wrote a piece about this for a Baylor journal a couple years ago–I've pasted a link below. One pastor I know who thinks a lot about these issues and who has worked hard to introduce her congregation to the idea of children being in worship is Grace Hackney, a United Methodist pastor in North Carolina. (She spoke at the Summer Gathering a few years ago about her church's community garden). I've also pasted a link to her church's website. All the best to you, Debbie! Only today we gave out our 3rd grade Bibles at worship. I actually had a parent tell me that her son would be returning to my Sunday School class about 1/2 way into my lesson because "he could not sit through worship." I felt like a babysitter. If children were made to feel more a part of worship, perhaps they could better sit through it. AND if parents would guide their children through the readings, hymns, and prayers, they would see more of a connection and be more interested. Thanks for once again giving us something to chew on. At Englewood, we have been seeking to have our children with us in the service in more meaningful ways, but it is not easy. The terrible acoustics in our auditorium mean that we can all hear every little noise (including adult noises!) so a whimpering child or a crying baby makes listening hard. Currently we have kids older than 4 with us for most of the service, sending them out only for the sermon time. This is working fairly well. Today they came bounding back in joyfully just as we prepared for the Lord's Supper. Sermon title "The Road to Hell"
Thanks for raising such an important discussion. I appreciated Scott's comment that there can be many different faithful ways to live this out and that there can be seasonal changes to how we approach children in worship. We meet in a large living room and there is now at least one of our longtime elderly members who is no longer able to participate in much of the service largely because of the kid mayhem. Currently our kids participate in the breaking of the bread (we bookend our service with the bread at the beginning and the cup at the end – so they share the bread but not the cup), a shared meal (with the expectation that it's a social time not a play time and adults are encouraged to sit and share a conversation with the a kid), some singing and then a sharing time we call "affirmation time" which is a time we share how we have seen God at work in our kids (we have an adult one later on). The kids then go out of the service. We are continually experimenting with ways to do "sunday school" which is currently after school during the week. I often create a false dichotomy by framing the issue as either ignoring children or catering everything to them. I need to remember that they, like we, are part(an important part) of something larger than themselves. That we, together with them, are part of the people of God and the work of God – concretely locally as well as part of a long history that came before us and an ongoing story. This calls us to patience and creativity as I think of including them and helps me frame my call and nurture of them to be considerate and caring as they participate with others. I love the way Debra talks about the "story" vs the moral lessons the gospel is often reduced to for children. Telling and living that story well, individually and as a body, with and for our kids, is a life goal in and of itself. I so often fear turning Jesus into the sweet Victorian nanny, that I shy away from trying to tell the story well altogether. I found great comfort in Debra's line "there are privileges reserved for their maturity, mysteries and riches of the worshiping life that reveal themselves as rewards for years of practice and perseverance." This is a long story, one we're telling and one we are living with our kids. Hopefully our only shot at telling it well isn't on Sunday morning (or evening in our case). Jeremy – thanks for the greetings and encouragement. We met our second daughter's birthmother at that trip to Portland.